Facebook has recently announced a crack down in "like" incentivizing; here's a look at what the policy actually says and what it means for bloggers! 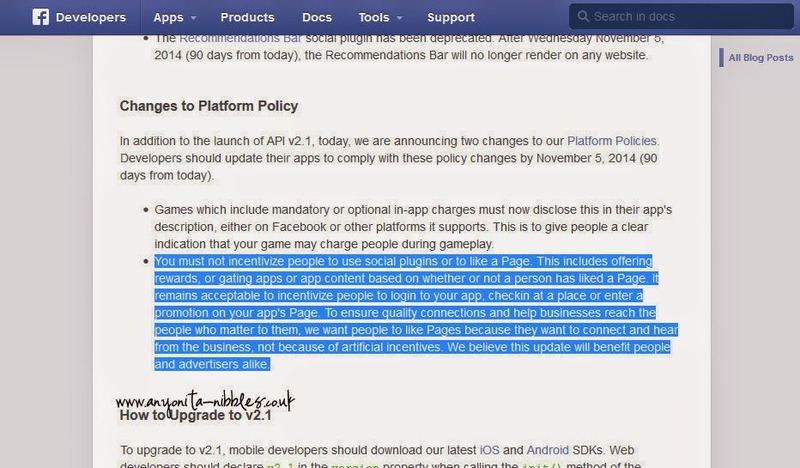 On August 7, 2014, Facebook released a series of announcements about policy changes referring to the practice of incentivizing people to "use social plugins or to like a Page". 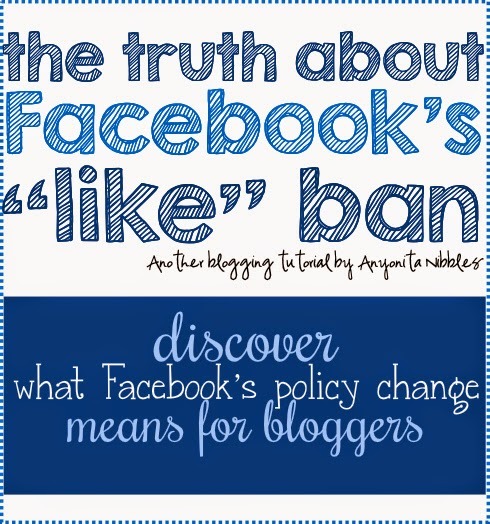 This tutorial will be an in-depth look at what Facebook's policy actually says and what it means for bloggers. The answer may not be as drastic as you think it is. If you run giveaways on your blog in connection with your Facebook page, then this tutorial is especially for you. You must not incentivize people to use social plugins or to like a Page. 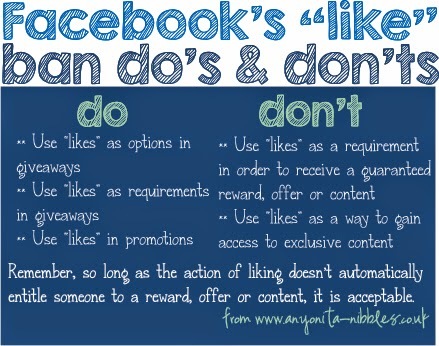 This includes offering rewards, or gating apps or app content based on whether or not a person has liked a Page. It remains acceptable to incentivize people to login to your app, checkin at a place or enter a promotion on your app's Page. To ensure quality connections and help businesses reach the people who matter to them, we want people to like Pages because they want to connect and hear from the businesses, not because of artificial incentives. We believe this update will benefit people and advertisers alike. The policy implies that an incentive is an instance when a person likes a Facebook Page in exchange for some type of guaranteed reward, offer or content. My interpretation is: if a blogger says, "If you like my Facebook Page, I will send you a free e-book or access to exclusive content." This is an incentive because the person liking the page will have done something (liked the page) to receive something (the e-book) and everyone who performs this action will receive the reward, offer or content. In short, this is an incentive because everyone who performs the action receives something in return. The policy does state that it remains acceptable to encourage people to like a page by entering a promotion (giveaway) so long as every entry does not result in a reward, offer or content. My interpretation is: there may be one or more promotion (giveaway) winners, but not everyone who enters will win, therefore, you have not incentivized their like. This is not an incentive because even though people have performed an action, they are not receiving anything in return. The bottom line is if you perform an action with the intent of receiving a reward, offer or content, it is an incentive. If you perform an action with the possibility of receiving a reward, offer or content, it is not an incentive, it is an option. Going forward, bloggers are still able to encourage likes through Rafflecopter giveaways because every person who enters by liking the Facebook Page in question, will not receive anything. Even if you ran a giveaway and required people to like your Facebook page in order to enter, this is still allowed by the revamped Facebook policy. This is allowed because an entry in a promotion (giveaway) is not an incentive and it does not guarantee a reward, offer or content. According to that policy, Facebook wants people to connect with businesses and blogs that matter to them. Facebook is not blocking the growth of Pages through likes, it is simply ensuring that no one is kept from a reward, offer or content because they have not liked a Page. Rafflecopter have stated that they will no longer allow Facebook likes as a giveaway option. I should have mentioned this in my post originally, but this is to be expected. If you take another look at the statement Facebook released, you'll notice that it specifically talks about apps. Rafflecopter is an app and as such, is subject to this new policy, effectively within 90 days from the date of issue. This does not mean bloggers cannot encourage likes as we have been doing. My understanding of this policy is that you cannot trade a like for a reward, offer or content. Using likes as a criteria of eligibility is not like gating or app gating. The tricky bit is with Rafflecopter and other such services being held to Facebook's new policy, it will become very difficult and time consuming (if not almost entirely impossible!) for page owners to know whether someone has liked their page, since Facebook keeps this information mostly secret. Therefore, the ability to use likes in a reward is not against Facebook's policy, so long as you do not use them to trade a reward, offer or content. But the feasibility of using likes in this way is so difficult, that I wouldn't be surprised if the number of giveaways bloggers host is cut dramatically. What's your reaction to this new policy? I appreciate you breaking this down for us. It's very helpful. Thank you!! Thank you for covering this facebook directive; I was unaware of it but am glad you pointed it out so aptly. Thank you for the FB update. I'm often very confused with FB. But it also says you can't gate apps or app content with a like. If people can't see the rafflecopter until they've liked your Facebook page, haven't you gated the rafflecopter app with a like? There's always an option on Rafflecopter, not to block it or mar the visibility. The Rafflecopters that keep options hidden until a certain action or set number of actions is performed is set by the individual host; it is not a requirement for having a Rafflecopter. If you do set up your Rafflecopter in such a way that additional entries are blocked until someone likes your Facebook page, you *will* be gating the Rafflecopter with a like. If you simply leave the option as an option that people can choose to take or leave, you won't be gating. Gating is withholding content, information, rewards etc until a specific action is performed. Unfortunately, though, Rafflecopter is an app and as an app, they have no way around Facebook's new policy. The same way Rafflecopter does not allow G+ profiles or content on their giveaways, they'll stop allowing Facebook information, too and it will be down to the individual bloggers/business owners to come up with a way to work around this. I think we should have some Flash giveaways on Facebook until it comes into effect! The sharing of pages has been wonderful. Do you do shares? I'd love to do a Share 4 Share with you, Anyonita. Thanks Anyonita, great info as usual! I've been so swamped lately and getting ready for a trip that this new policy has only come to light for me over the last few days. I was planning on looking into it more when we return from our travels.